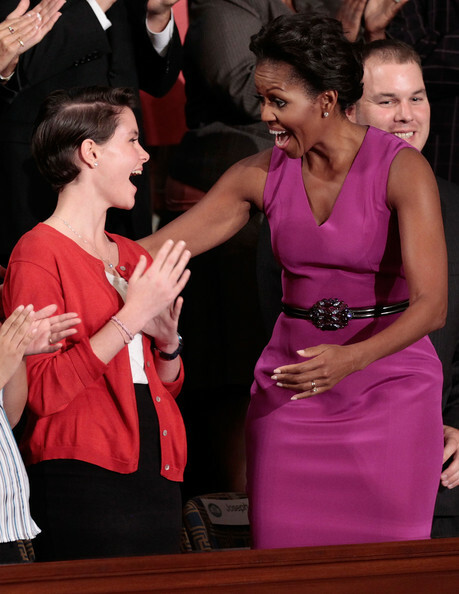 U.S. first lady Michelle Obama (R) greets Kelcie Fisher (L) a senior at Open High, in Richmond, Virginia prior to the start of a Joint Session of Congress where U.S. President Barack Obama is scheduled to speak at the U.S. Capitol September 8, 2011 in Washington, DC. Obama will address both houses of the U.S. legislature to highlight his plan to create jobs for millions of out of work Americans. Michelle Obama's sheath dress and gemstone belt were a flawless pairing.